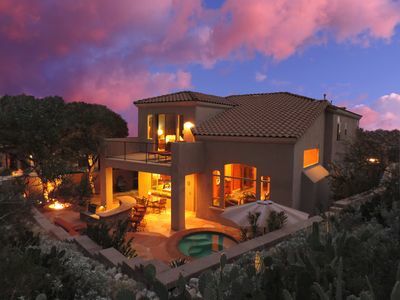 to bask in Tucson’s warm climate. 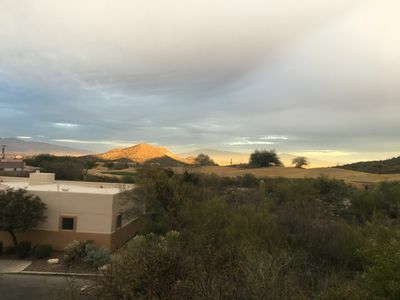 Tucson boasts the most number of sunny days a year in America and guests want to take full advantage of all that sunshine. 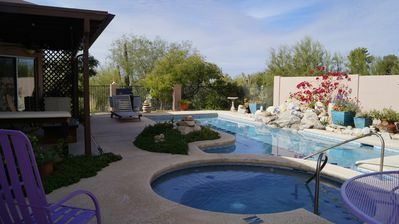 The Tucson Gateway offers a pebble tec pool with available gas heat surrounded by natural stones and boulders for a refreshing dip even during the coldest months of the year when you’re neighbors back home are wearing parkas. Take in spectacular sunsets, mountain views, and twinkling city night lights all from the bubbling warmth of an oversized spa. 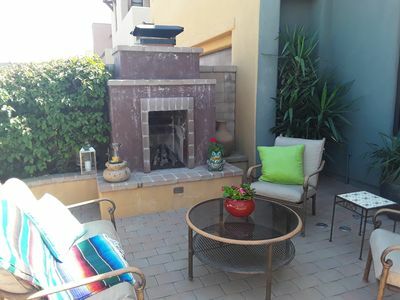 Enjoy gracious outdoor living in any 1 of 5 patio areas each with intimate seating areas situated all around the home. Read a favorite book while lounging in the sun or relax in each other’s company under starry nights around a crackling fire pit. 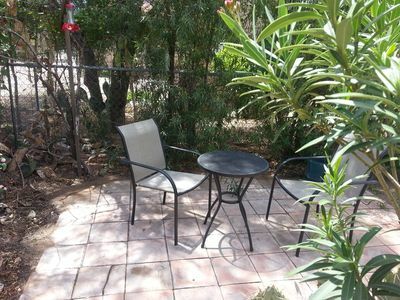 One of the many things guests love about Tucson besides the climate are the natural spaces and wildlife. 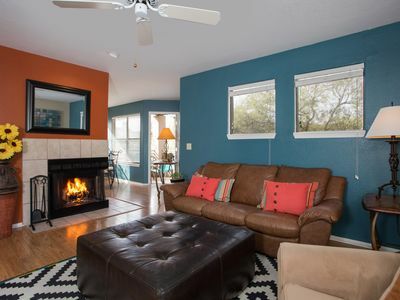 The day we received the keys for this new home I happened to glance out a bedroom window as I was locking windows and doors to notice a deer fawn curled up next to the a/c unit with Mom watching from her lay spot on the other side of the driveway. 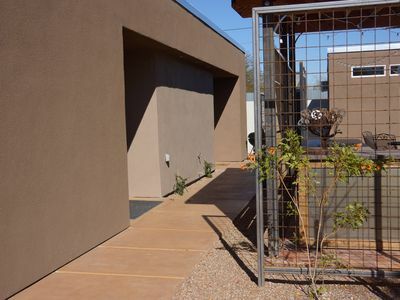 The acre of natural desert surrounding the home increases privacy and acts as a noise buffer leaving you in solitude although there’s still the comfort of neighboring homes nearby and even better some of the best dining and shopping that Tucson has to offer within walking distance. Because an important part of living well is eating well. 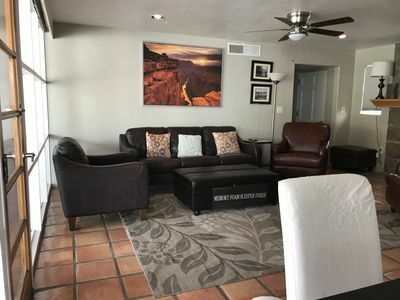 From the Tucson Gateway you can walk to some of Tucson’s finest restaurants like Vivace’s or Fleming’s and wave at the valet as you’re greeted by the maitre d’ for your reservation. Prefer more casual dining within walking distance? Tucson’s Mexican food is legendary, we invented the chimichanga after all, and Blanco Tacos and Tequila can inspire some lively meals. Maybe wood fired salmon at Firebirds or another surf/turf meal is more to your taste in their casual yet upscale lodge atmosphere. Check out Ra’s Sushi Bar for creative rolls or maybe take home a white pizza from Humble Pies. For conscious dining with emphasis on fresh, sustainable ingredients walk on over to Goodness. Just want a nice place to have a drink? Then stroll over to The Living Room. It's a great neighborhood hang out with cozy indoor spaces as well as soft seating in open air spaces to stretch out in with tasty lounge food. Whatever you choose, any meal can be made better with a Gelato from Frost’s. On your walk home make sure to stop by this Gelateria that imports their ingredients all the way from Italy. There are many more delicious dining options available you can walk to we just don’t have enough space here to tell you about them all so check out the dining guide in the kitchen for a more comprehensive list. 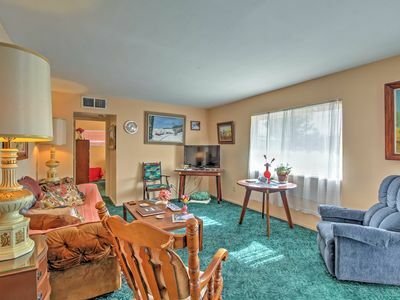 Besides as comfortable as this home is, you might prefer take out or delivery that beats any hotel room service in town in both quality and value. For the stay at home cooks you’re within walking distance of AJ’s Fine Foods a boutique grocery store offering gourmet foods and talented chefs in their bistro, sushi bar, bakery, and grill. Chat with the wine staff about the perfect pairing for that Southwestern dish you’re planning. Looking for something a little more familiar? Whole Foods as well as Trader Joes both of which are national grocery chains offering the finest natural and organic foods available are within 2 miles. 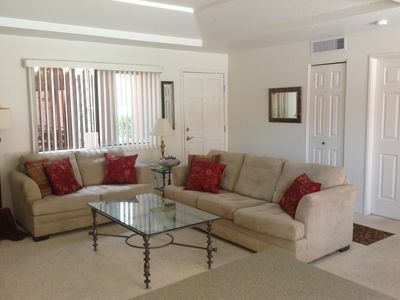 Nearby La Encantada, an outdoor shopping center, brings luxury to within walking distance. Don’t be surprised if you keep coming back to shop at Tiffany’s, Louis Vuitton, Coach, or Williams-Sonoma. So grab a free sample of fresh brewed tea from Teavana or fresh roasted, organic coffee from Savaya’s and indulge yourself in some much deserved shopping. For the fun lovers there’s an Apple Store, game store, and toy store. Spend a whole day touring several of Tucson’s favorite art galleries just a leisurely walk from the home. Stop by Shlomo’s New York Style Deli for a quick bite before continuing your exploration of Tucson’s art culture. 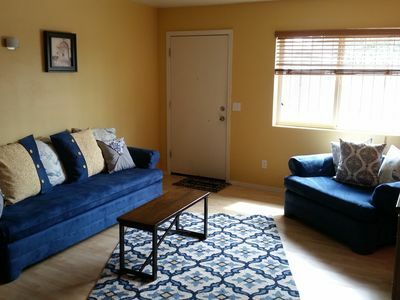 With 2 master bedrooms similarly furnished to choose from, quarrels about who gets the best room can be avoided because now you’ll all have the best room. 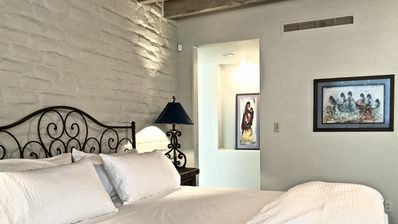 Spiced with old Spanish romance each room features windows with expansive views, distinctive beehive fireplaces characteristic of the Southwest, sitting areas and flat screen tv’s for lazy days when you don’t want to get out of bed. Someone else visiting with you? There’s yet another bedroom with it’s own bath for privacy lovers or bring more guests and share the 3rd bath with the 4th bedroom occupants. 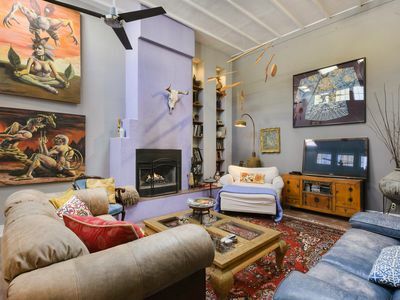 This home features interior spaces designed with an emphasis on comfort. 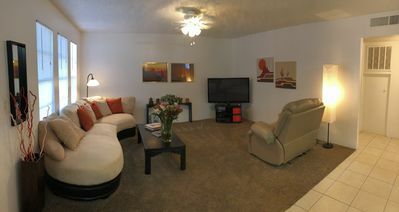 Since comfort is such a subjective quality we made the spaces visually appealing too. 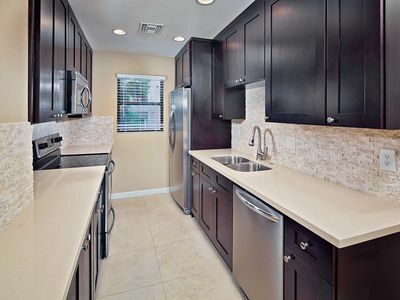 Enjoy concrete kitchen countertops and 14” that walls that provide comfortable interior temperatures all year long. Each wing of the house has it’s own heating and cooling unit controlled by thermostats to accommodate different temperature preferences. 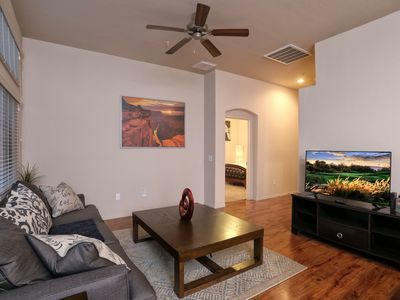 You’ll have an authentic Tucson experience in a home designed in Tucson’s traditional architectural style dating back to 1775 including all the amenities of modern living. Hand carved corbels and woodwork enhance the appeal of “feel good” spaces. Wood beamed ceilings add that touch of rustic Tucson charm. 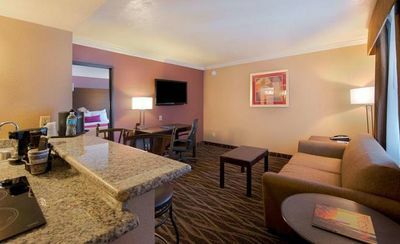 Indulge yourself in an authentic Tucson experience that will continue to provide rewarding memories for years to come. 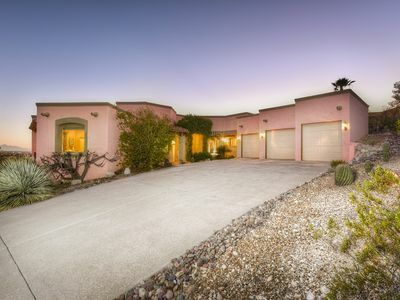 Desert Oasis With Massive Pool Near UA! Traveling Nurses and Military Welcome - You're Going to Love ❤️ It! 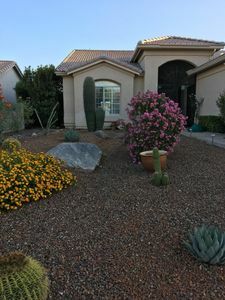 Close To Clubhouse, Mountain Views In Beautiful Saddlebrooke AZ! 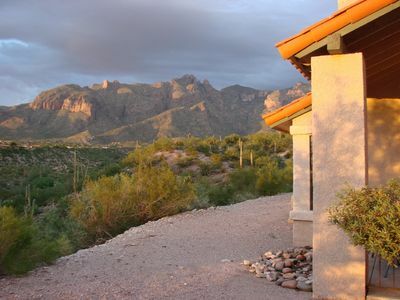 Catalina Foothills Great Mountain and Desert Views! 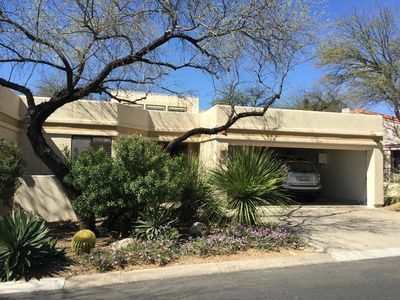 Cozy Tucson House w/Patio & Catalina Mtn Views! Catalina View luxury condo home. Great Tucson Retreat! Golf! Sun! Swimming! Relaxation! Casa del Roble where Spring has Sprung in the Desert!